This is so sad man. I feel so sad for those babies. When I saw this I just broke down crying. It is never a good thing when someone loses they're life so tragically. My heart goes out to the family. How To Get Exercise On The Road? Its actually quite easy to get exercise while on the road. You can easily take advantage of the small space you have inside the cab of your truck. You can run in place for 25 to 30 minutes using the cab of your truck. I know it may sound a little boring running in place but you can crank the music up inside the cab and before you know it those 25 to 30 minutes will fly by. You can also use the same space to do pushups and jumping jacks. With the pushups just put your feet up on your bunk and do as many pushups as you can rest and repeat again. With the jumping jacks just turn sideways inside the cab inbetween the drivers seat and passenger seat and knock out a couple. You can also do a couple outside next to the truck. Now with food choices its all about moderation versus unhealthy. You can eat a little unhealthy here and there as long as its in moderation. I follow this rule of thumb on a daily basis. Companies that take an accident/termination?? What where the circumstances behind the accident? Did the driver of the rental truck crash into the back of you while you were pulled over? Did you have your four-way flashers on while pulled over? Did the driver of the rental truck crash into you when you were trying to pull back onto the roadway? If the driver crashed into your trailer while you were parked on the shoulder then it sounds like it was they're fault, assuming you had your four-way flashers on. LOL. I'm not really commenting dude, I'm really giving you a dose of reality. Like Daniel B. said I'd would rather donate my hard earned money to someone I know really needs it like a homeless family, or a family who can't cover their sick child's medical bills. To me you seem like the type of person who has never worked for anything in their life, but I could be wrong. LOL. I can guarantee you no one from this site will donate to your cause if that's what you want to call it. Like I said before if you really want this you have to earn it. It's nothing wrong with being under a contract for a year, so as long as your doing what your suppose to do, you will be okay. And I wouldn't listen to outside forces (LOL), just because it didn't work out for them for whatever reason, that doesn't mean it won't work out for you. ROTFL Dude you can't be serious. Everyone who comes this forum are seeking advice about becoming a truck driver and you come asking for money. LMFAO. These guys are giving you advice how to become one and you throw it back in their face. Seriously. I know this is not a forum that judges people on their comments but dude this by far has got to be the most silliest thing I have ever heard in my 30 years of being on this earth. Every trucker here have paid their dues and the ones coming into trucking also have to pay their dues. And plus I think these guys girlfriends, wives, children, or mistresses LOL will appreciate you begging them for money. LMFAO. Get serious dude. If you want this you going to have to earn just like everyone else. I live in Cordova, TN with a friend and its only like 25 minutes away from Millington. I just wasn't sure about the physical. I know it is more than 60 days old. I will have my permit before I attend the academy. I just wanted to know if there were any other fees that needed to be paid ahead of time. What was your experience like? Was it hard or somewhat easy to pass the academy? I know it has been a while since I asked a question on Trucking Truth. I have been lurking on this forum just absorbing all the informative advice from everyone. I love you guys for all the useful information. A while back I was scheduled to attend Swift's academy in Millington, TN but I fell on some hard times. I lost my job and later on I was evicted from my apartment because of this. I should have attended school when I had the money but I had to pay a couple of things off and did not anticipate that I would lose my job. As of right now I do not have a place to live but I'm making it one day at a time. I am praying for miracle as of now. Errol V. I have been reading your training dairies and I took noticed that you attend the academy in Millington, TN. I just wanted to ask you a couple of questions about the academy. First question is do I need any up front money while attending the academy? I asked my recruiter and she said no, but we both know they will sometimes lie to you. I wanted to know before attending because I am limited of funds at the moment. Second question is about my DOT physical. I took my DOT physical back in October of 2014 and I received a two year med card. On Swift's website I notice that the DOT physical cannot be older than 60 days prior to attending the academy. I wanted to know will this be a problem for me? I am schedule to attend the academy the 27th of April. I am literally like 20 minutes away from the academy, but I plan on taking the housing agreement because I do not have a place to live at the moment. Any advice that I receive is greatly appreciated. Marcus he is just starting out, so making that 7.25 an hour is more than fair. After his training he will definitely be making more money. And a major difference in driving a truck and working at Macdonald's, at Macdonald's after about five years you will probably be making the same amount of money as when you first started. In trucking the possibility of the type of money you can make in five years is almost limitless. Thank you Rolling Thunder. I most certainly will. Hopefully I can everyone updated on my Journey. I would like to thank Brett and everyone here at Trucking Truth for all the amazing information I have soaked in. I recently obtained my CDL permit last week and I am all set to attend Swift's academy in Millington, TN on the 10th of this month. I have never been more excited and scared in all my life. This site is the number thing that keeps me motivated to achieve greatness in my life. I have struggled for a while trying to decide if trucking is the right career for me. I now know that it is because I can't picture myself doing anything else in my life. I chose this career over law enforcement, and I have a degree in Law Enforcement that I will probably never get to use. I feel like Trucking is my calling and I love the smell of the diesel I smell as I'm riding down the highway next to all the big rigs. I plan on going with knight transport after training. Everyone please wish me luck. Swift Academy in Millington, TN. Why are people dropping like flies? This makes no sense to me at all? These companies want to put drivers on the road to make money yet they drop like flies? Please elaborate because I also am due to start at swift academy in richmond va. If this is the case as you claim I will not even bother attending the school. Cdg86 I don't know about the swift academy because I have attended myself, but I want to. At C1 in Little Rock everyone mostly failed out or dropped out did so because of medical history or didn't like how the school was run. Some even said that the instructors weren't teaching them enough to pass the state's exam. This is the reason why I left the school and I did not want to be stuck with a 6000 dollar bill if I fail out of the school. I believe if I would have stayed that maybe I would have pass If I just applied myself more. I have been following your journey through the swift academy in Richmond. I feel bad for those who failed out of the academy. I just needed some facts about the school and I should do to be successful to graduate from the academy and obtain my CDL. Any information about what to do and what not to do would be very helpful. Thank You. I want to know if someone could give me some information regarding the swift academy in Millington Tennessee. In November of 2012, I attended C1 trucking school in Little Rock Arkansas, but left after a couple of days because mostly everyone there was failing out the school left to right. This the reason why I want to find out about the swift Millington school before I decide to attend. I have been scheduled to attend this academy since august but I keep pushing my start date back. I have to admit I am a little nervous because I don't know what to expect. 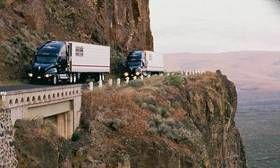 I have been reading horror stories from drivers who have driven for swift, but I do not believe everything I read on other trucking sites. It has been very difficult to make up my mind go through the academy. I appreciate any info that I receive. Hello everyone, I have a question concerning employment history. I have been unemployed for almost two years. October will actually be two years for me. I plan to go through company sponsored training with swift in the beginning of September. I want to know if my unemployment history will be a problem. No convictions, dui, traffic violations, or anything else that would hold me back, just unemployment history.